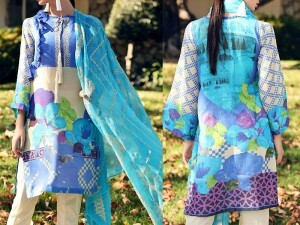 When it comes to summer clothing, ladies always prefer to have a variety of Lawn Suits in latest designs and vibrant colors which are favorable for their personality. PakStyle.pk presents ZS Textiles RangReza Lawn Collection 2019 at affordable prices online in Pakistan. This elegant design ZS Textile RangReza Lawn 2019 with Lawn Dupatta ZS-7B belongs to ZS Textile RangReza Lawn Collection 2019 Volume 1 that has unique colors, patterns and eye caching designs will complete the need of every women and will pass the best value for the money. By ordering this ZS Textile RangReza Lawn 2019 with Lawn Dupatta ZS-7B you will get 3-Piece RangReza Lawn Suit. ZS Textile RangReza Lawn 2019 with Lawn Dupatta ZS-7B Price in Pakistan (Code: M011710) offer by PakStyle are just Rs.1295/- instead of Rs.1750/-. 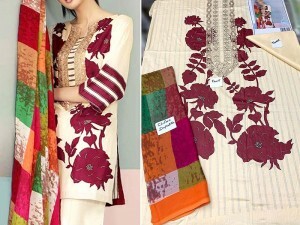 Buy ZS Textile RangReza Lawn 2019 with Lawn Dupatta ZS-7B Online in Pakistan and variety of other products like Womens Clothing, Lawn Suits at PakStyle.pk and enjoy Fast Shipping with Free Home Delivery in Karachi, Lahore, Rawalpindi, Islamabad, Faisalabad, Hyderabad, Quetta, Peshawar, all across Pakistan and get it delivered in 1-4 working days.